So far a big part of my blogging journey has focused on thinking back to my previous financial decisions. I admit that I’m pretty critical of myself, but I feel that is necessary if you really want to improve. You can’t always just put on your rose colored glasses and tell yourself that you’re doing pretty well. Sometimes you have to accept the truth that you’ve made some mistakes. You don’t have to dwell on those things and get yourself down. The key is that you somehow learn from those mistakes. One area that I was particularly naive was how I viewed health. I thought that while I was young with no obvious problems that I just didn’t need to worry about it. As a result I was irresponsible and abused my body. This may not seem like a financial mistake, but I’m really learning it all comes full circle. Your body is a fine tuned machine. If you don’t take care of it, it simply won’t operate properly. The surprising part is that the results can be experienced where you don’t expect them. Specifically, how you treat your body can affect how your brain functions. In my case I let my career choice and drive come way ahead of my health. I spent long hours sitting in front of a computer, getting inadequate exercise and eating poorly. I was consuming plenty of toxins and I wasn’t doing anything to help my body purge them. I kept telling myself that once my online business picked up, I would spend the extra money on healthier food and allocate more time to exercise. Meanwhile little did I realize that these choices were limiting my career growth by making me extremely irritable and depressed. On top of that I was exhibiting physical symptoms that reduced my confidence levels and discouraged me from pursuing many opportunities. Somehow I didn’t realize the obvious connection between my health choices and my moods. I figured I was just naturally an angry guy and that I would have to deal with it psychologically at some point. Maybe I just subconsciously didn’t want to give up my fast food, sweets, alcohol and drugs. Yep I was pretty dumb. As a result of my mental state I would just get fed up at my jobs after a while. Eventually I’d get too overwhelmed by little things that were making me angry. I’d either end up quitting or stop putting sufficient effort into my job. In my mind the only long term solution was to get my online business profitable enough so that I could avoid the stresses of a daytime job. Drifting through my career like that was a recipe for failure. I was skilled with my work, but I wasn’t able to maintain momentum to build up substantial commission at my daytime jobs. By avoiding the higher end jobs in my industry, I was rarely working in a company with room for upward growth. It all came down to how I was neglecting my health and creating a dangerous cycle of mental destruction. Like many people with mental struggles, I had to go through some rough times to realize I needed to do something about it. What woke me up was having a relationship fail after 7+ years and being without a job when I was suddenly faced with paying higher rent and bills. My already low self esteem was being severely tested. I was lucky enough to come across a book from an alternative medicine doctor who I know my mom had a lot of faith in. I decided it was worth checking out. The book was Spontaneous Happiness by Dr. Andrew Weil. Basically it opened my mind to how important physical health is to maintain mental well being. When I got thinking of how bad I treated my body, it was all starting to make sense. I’m still in the process of putting Dr. Weil’s advice into practice, but I’m already noticing a big difference. I’ve been getting outdoors more, eating better and exercising more. Those lifestyle changes are making me much happier and I’m in the best shape in a long time. Just this past weekend I had an appointment with a naturopath to discuss the problems that I’m still dealing with. She further emphasized what I had already been reading. Plus she explained how all the toxins in my system were clogging up my organs and limiting their effectiveness. So I just started doing a liver detox routine with some daily medicine and further improving my diet. Now I know exactly which foods and beverages I should be avoiding and which ones I should be getting more of. The tricky part is phasing out all the unhealthy stuff that I’m so used to eating. That will take a bit of time. 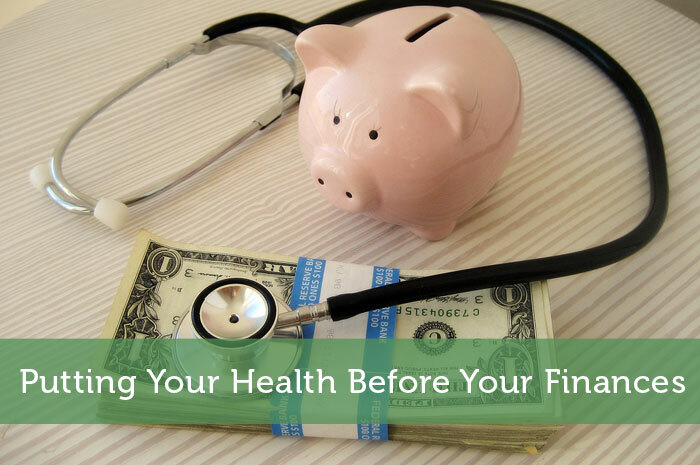 Has your health ever negatively affected your finances? Do you feel that taking care of your health will lead you to more savings? Are you doing everything within your power to lead a healthy lifestyle? If not, what do you feel is stopping you? Yeah I already feel so much better and I’m still in the transition phase with improving what I eat. Once I get that under control I know my sleep will improve and I’ll have even more energy. My moods improving will be huge too. Life is too short to waste time being angry. I just watched a Nat’l Geographic documentary last night on the effects of stress on our health; it’s amazing how damaging it is. The documentary highlighted some studies that showed our health is dependent on where we think we are at on the social ladder, which does have a correlation to money. Glad to hear that you are finding your way through this. We are the same age and I know what you are describing. I too always thought I was healthy and could do anything I want. I’ve been interested in various detox regimens before but have never pulled the trigger. Let us know how it goes. Yes stress does affect the whole cycle a lot too. If you are eating well and getting plenty of exercise you are better equipped to deal with that stress. I do think I was getting too stressed out, but I’m pretty sure that was compounded by my unhealthy lifestyle. I don’t know if everyone needs to go through this kind of detox regimen, but I think it does help to take into consideration what kinds of foods are building up extra toxins. I used to be a workaholic at the office early in my career, and still am to a degree with multiple blogs on the go, and a home business that needs my time as well. However, I learned it’s important to take time away from all the work, so I play soccer 3x per week (3 teams), run, work out in my office gym, and try to golf twice a week. Having not to think about work for a day or few hours gives me enough to recharge. Funny enough though, I could never be one of those people that go to a 2 week all-inclusive resort. Somehow I’d go insane with just sitting, eating, drinking and sleeping. Good to hear that you’re not letting your career overtake your health responsibilities. All that exercise will definitely help you recharge and keep your mind sharper. I’m the same way that I’d get all antsy if I took too long a break from work. 2 or 3 days here and there is nice, but more than that and I just feel the need to get some work done. Jeremy, it’s great to see that you’re focusing on this aspect of your life. There is no doubt that being lazy and eating unhealthy are some extremely easy traps to fall into. It’s like managing money well…if was easy, everybody would do it. However, it’s not easy, but it is worth it. Eating healthy and upkeeping your body is difficult but it makes you feel a ton better. My in-laws are in town this weekend and we all went on a 3-mile run this morning and did some yoga when we got back. It’s impressive how much more energy you get and how awake and ready for the day you are after doing something like that. Good luck sir in your journey! Hearing about your lifestyle if great motivation Jason. I swear one of these days I’m going to add some of your recipes into my diet. I’m finally ready to accept just how important a healthy lifestyle is. All of that crap that was in my lifestyle before is going to be phased out. I’m too cheap to just throw out some of the stuff in my cupboard, but once it’s all used up, I’ll be moving on to healthier options. Some stuff I’ll probably just give away too. This weekend I gave away some stuff that was pretty unhealthy, partly because of your advice. I try as much as possible to maintain a healthy lifestyle through exercise and clean eating, it’s very necessary to my mental well being. Don’t worry about lost time, just be happy you’re starting now and that it didn’t take a heart attack at 40 to wake you up. Looking forward to hearing more about your transformation. Haha, I’m still a long ways away from the true healthy side that people like you and Jason are on. I sure won’t be running any long distance races anytime soon. I’m not too worried about the lost time since I’m realizing how much more productive I can be with a healthy mind. I do try to fit in my workouts while watching sports which kills two birds with one stone. I also know that my career will have a lot more growth potential if I improve my mental and physical state. Thanks for sharing your story. I have checked out Dr. Weil’s book a couple times but never cracked it! I want to help my husband implement some changes as I think his sleep and eating habits leave something to be desired. I don’t want him to get to where you were with your mental health. I’m so glad you’re turning things around! Creating new habits is so much easier when you can experience immediate rewards for your new actions. I do recommend you start reading Dr. Weil’s book. There’s plenty of great advice in there even if you already lead a fairly healthy lifestyle. Your husband’s eating and sleep habits likely go hand in hand. If people feel healthy though, it’s tough to get them to really want to change their habits. I definitely spend more money when I am stressed. I buy “treats” to make myself feel better,but end up feeling worse in the long run.Glad to hear you’re focusing on your health! I tend to do a bit of emotional eating. It’s definitely not the best way to try to address those issues. When you start thinking of that kind of food as toxins, you really start to think twice about that stress induced unhealthy eating. Mmmm salt and vinegar. I love those, but probably not great for me considering they are pretty much the only food that makes me break out in a slight sweat on my cheeks. At the beginning of this year I did something similar and went on a 3 week cleanse (aka food rehab). I gave up sugar, soda, caffeine and all processed foods. Plus I started exercising more and getting more active. It was hard at first, but now I’m so thankful I did it. Like you, I know exactly what foods make my body react, either in a positive or negative way. It’s pretty astounding really, since I can eat something with a lot of toxins and my body immediately gets sick. Most of the time it’s just not worth it. I too am wondering if I had done this a few years ago, how much better I might feel now. But I’m thankful I finally did make a change, and for that we should be proud of ourselves. Yep sounds like some of the kinds of foods that I’m going to be giving up. For me I’ll also be avoiding things like potatoes, tomatoes, peanut butter, dairy, etc. Some of it is just temporary giving those up to basically give my liver a break to try catch up. I had already started exercising a lot more and that has been a great move. Being more in shape makes me more confident on its own, but it also helps me sleep better and I’ve heard it helps your organs detoxify better. The diet change will definitely be the tougher part for me. I’ve ate poorly for a long time, while I used to be very active with sports and outdoor activities. Thanks for sharing your experiences with this Carrie. Ironically, I had more mental health problems when I was eating healthier. Whether or not I’m doing everything in my power to lead a healthy lifestyle is a subjective question. I’m sure plenty of others would say I’m not, but aside from remembering to include vegetables in my dinner, I don’t really believe that the things I’m not doing are as beneficial to my health as they claim. Perhaps the particular vegetables you were eating more of were some of the dirtier varieties with lots of pesticides absorbed. Also what may seem like a healthy diet may still have all kinds of hormones and other toxins. Plenty of exercise is always good too. It just helps your whole system operate more efficiently. The extra blood flow helps some organs do their job much better. You may be mistaken about which foods you need and which you should avoid. While many people do better eating whole grains, low fat and/or vegetarian, a lot of us need to drop grains altogether and get more saturated fat into our diets. Those so called healthy diets are often a recipe for depression. That very well could be the case. I’m no dietician by any means. The naturopath I’m seeing is though. So I’m going to trust her opinion and give it a shot. It’s bound to be better than the horrible diet I had in the past where I was consuming far too much processed sugar, empty calories and various toxins. Congratulations on making the move towards a healthy lifestyle. There’s nothing in life that is so important that warrants overlooking one’s health. As you’ve pointed out, you can’t do well if you don’t feel well. You can’t move forward in the other areas of your life if you don’t address the important health aspects first. Great job! Keep it up. Thanks Anthony. In my mind, I thought I could just temporary neglect these things and eventually make up for lost time. That just delayed my financial freedom though by stunting my career. Since my physical health seemed fine, I figured I had little to worry about. Really though, it was all building up into problems. This is quite a story. I sympathize with your situation and hope that your efforts turn it around. There are many times I neglect to do what is important whether its health, career, spending time with the people I care about. I’d even go so far to say that blogging has sometimes become a distraction. But like all things, you take a step back and access the situation. Putting priority on your health will always be a smart move. Yes blogging or running other side businesses makes it tougher to keep up more important areas of your life. Any business can sacrifice a little bit of time for exercise and healthy eating. You just have to accept how truly important that is. I often take for granted my health. I am naturally thin so I never worry about what I eat. Eating healthy is definitely an area in my life I could improve. I guess the trick would be just slowly phasing out the junk and replacing it with something more healthy. Good luck to you! Just think about how much better you will feel and let that be your motivation. I guess people would naturally good metabolism would feel even less pressure to eat healthy. Those people must still be negatively affected in other ways besides weight gain. It must still add excess toxins for your organs to deal with. It’s the kind of thing that you can easily just shrug off until you actually recognize negative effects. Of course it’s much better to address it before it gets to that point. Jeremy, good post. Too often we let our health take a back seat to everything else, but it really is important to maintain a healthy lifestyle. I’m glad to see that you’re getting your health back on track and are seeing positive results! Keep it up! Thanks for the encouragement Justin. People really do take their health for granted. They figure since they’re not being forced to go to the hospital for anything, they must be fine. You can’t physically see damage that is building up though. If I’m going to get regular oil changes and do regular computer maintenance, I figure I should be taking that same mentality with my health. Nice work, Jeremy! I’m gad you were able to turn things around sooner rather than later. I’ve been doing the same, actually. I used to be a smoker who didn’t ever exercise. Because of it, I was always feeling like crap and gaining weight. After getting out of debt and getting my finances under control, I finally had the confidence in myself to tackle my physical health as well. I’ve since quit smoking and started running. These two things have been the best decision I’ve made in a long time. Here’s to both of us getting ourselves in shape and becoming more healthy! Thanks Kraig. And nice work yourself too! I’ve never regularly smoked cigarettes, but I’ve seen how difficult it is for people to give that up. I know doing so helps a lot with getting more active too. Suddenly you have so much more energy and you don’t get winded so easily. Now you just gotta give up those big bowls of ice cream I saw on your blog a little while back lol. I’m a sucker for sweets too. That will probably be the toughest thing for me to give up now that I’m getting on the right track. I am so proud of you for getting back on track with your physical health. It is so important. I wasn’t as healthy in the past as I am now and this did effect my finances. I often spent money to make myself feel better which was a lost cause. Since I have been more healthy my spending has decreased. Thanks Miss T. I have already started saving a lot of money on certain vices too. Some of the initial medical costs eat into that a bit, but that’s partly because I want to fast track the improvements and get back to optimal shape asap. It will be interesting to see how my spending is affected as my mood continues to improve. Oh my. I’m forwarding this in to my sister in law who is right now going through anger bout of depression and anxiety. I think I will even buy her the book just so she will get to it and read. She is so caught up in medication and drugs that she isn’t moving forward at all and I think these methods may kick start her recovery. I had a sister in law (on other side) who made a switch to s naturopathic lifestyle and swears by it. She sees holistic doctors instead of traditional doctors, even a dentist, and swears she will never go back. Thanks for reminding all of us that westn medicine of the day sometimes isn’t slays the best and there are alternative to it. Good luck with your journey. Sorry to hear about your sister in law Crystal. I admit I don’t know enough about naturopathy and non-traditional medicine. It might help her, but there are probably people who really do need meds. People who do get in the cycle of meds likely aren’t doing stuff like lots of exercise and healthy eating. So that may be just prolonging some of those cases. It’s worth a shot anyway. Western medicine has been overrun by the pharmaceutical companies where profit is king. I’m sure a lot less trusting of it after my experiences. I didn’t realize there were holistic dentists though. I’m not quite ready to give that a try. This is great, Jeremy! I’m so happy to hear that your life is improving as a result of your healthy choices. You are so right that health ultimately affects our finances. Study after study shows that when we’re sleep deprived or hungry we spend more money. Taking care of these issues at their root is the real solution. Congrats on your progress so far, and keep up the good work! After living unhealthy for so long it’s nice to finally smarten up and live a healthier lifestyle. I wasn’t motivated at all by any kind of spending problems though. For me it was more about my career and overall happiness. When it comes to food, we always put health first. It would be MUCH cheaper to just feed our kids and ourselves junk food– but instead, we tend to pay the extra to eat healthier whenever possible. I think it is worth it in the long run, and we will save overall on health care costs. I know I was horrible with my food choices. I got so used to having fast food throughout the week. I just convinced myself that healthier options would cost more money and require more effort. I’m now seeing the the extra cost and effort is well worth it. That is a small price to pay to feel better and take care of your body. Our health is one of those things that’s priceless, kind of like having more time. We don’t want realize how important they are, until we lose them. It’s great that you realized how vital your health is and decided to change it. That’s something we could learn from – putting our words into actions. Yep, we definitely take it for granted until there is a problem. It probably has to do with how most health problems are internal where you can’t see them building up. Eventually it gets bad enough to show other symptoms which can wake us up to the reality. Some just brush it aside as something they can just fix with medicine and no lifestyle changes. That isn’t getting to the root of the problem though. That is very interesting story. I see the connection between financial problems and health in generally now from other point of view. It definitely is all connected. If you’re struggling financially, you figure you can’t afford to take care of yourself. Or if you health is bad, you are spending extra money on medicine or doctor visits. It’s all a big cycle. Awesome to hear Jen. I’m slowing getting there, but the new diet will take some getting used to. Good luck with dealing with that smoking habit next 🙂 Then you’ll really get your cardio back and feel like a kid again.